Join us at a workshop to help teams prepare for submission to the USC Wrigley Sustainability Prize. The USC Wrigley Sustainability Prize is an annual entrepreneurial competition supporting environmental ideas with market potential from within the USC community. The Prize supports student entrepreneurship and advances creative ideas to merge business with sustainability thinking. This workshop, led by Albert Napoli from the USC Marshall School of Business, invites teams from all disciplines to learn about the basics of developing a business plan and pitch for their sustainable business ideas. 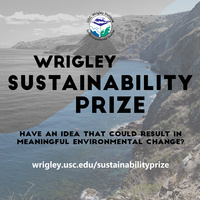 Submissions to the USC Wrigley Sustainability Prize are due one week later, on Feb 15th. Winning teams are selected in April 2019. Brought to you by the USC Wrigley Institute for Environmental Studies.